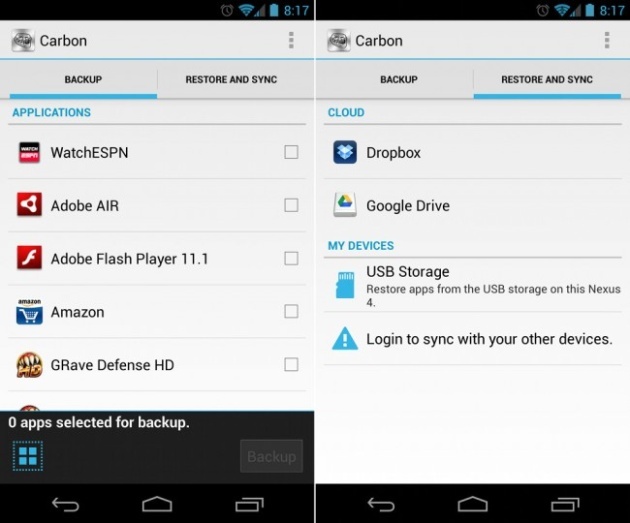 Many backup applications for Android need to be root or be connected to a computer to send data to it, but Carbon is clearly different from these for two reasons. The first is that one does not need to be root to make a backup of your data, and the second is that you can decide how to do the back-ups. 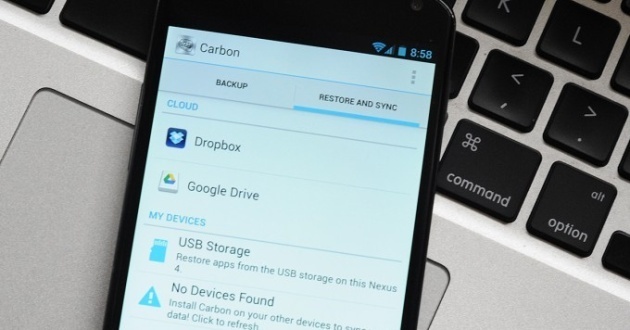 While the option to make back-ups to the device's SD Android or PC is available for free, the paid version of Carbon allows us to make back-ups to the cloud, dandones options to choose from online storage services of DropBox , Box or Google Drive , plus our configuration restore from it. If you have 3.71 euros to buy the premium version of the application, it is best to possess the same on your smartphone or tablet operating system Android , as it is very useful when performing back-ups. One last thing to note is that this application does not work correctly with any device Morotola since they have their own back-up mechanism and install the application would cause the same problem.